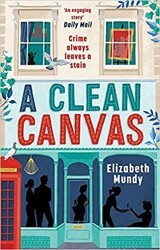 Once upon a time, the butler did it (allegedly), while for a much longer period the detective who identified the criminal was a foreigner (as Christmas’ ABC Murders on BBC reminded us); but things have changed, and Elizabeth Mundy is one of the authors who have changed these crime-fiction tropes. Mudy’s detective is Lena Szarka (a domestic help from Hungary), now setting up her own business in London, Lena’s Cleaners. In the first book of the series, In Strangers’ Houses, she worked for an agency. The new business, though, allows her to disguise her motives in searching the homes of suspects (offering a free trial-clean allowing her to snoop). But what is she investigating? A valuable picture has gone missing from an art gallery where she and her niece were working (during an exhibition). The gallery is clearly on its ‘uppers’ and everyone is a suspect including the cleaner, family and visitors. Unfortunately for Lena, when the police become involved, her niece Sarika falls under suspicion as the thief; particularly as Sarika disappears soon after the picture has gone missing. Lena is a driven woman, both in her business career and her need to investigate. Fortunately, she made a friend in In Strangers’ Houses, PC Cartwright, and he is willing to help her out as they appear to be moving beyond friendship. He is soon helping Lena investigate the world of graffiti artists in Brighton, and plays the window cleaner in her business, when she wishes to return for more suspect-spying. Lena’s life is full of incident, with some major reversals and surprises on the way. During a telephone call to her mother in Hungary Lena is told that she has never made a good stew that kept a man. Analogously, I found A Clean Canvas vaguely similar. It has an unhappy consistency; sometimes comic, sometimes serious (a death from In Strangers’ Houses lingers, now a Greek shopkeeper has been attacked and lies dying in UCL Hospital for most of the book); many of the characters are thinly drawn, and one or two are just caricatures; incidents occur and are quickly clarified; even the painting becomes a McGuffin rather than a Maltese Falcon. Though, it is very different in terms of crime-fiction style which makes this sophomore work interesting.